Bracelets are back – have you heard? Personally, we think that great bracelets have never left: gold horse jewelry never goes out of style. This fall’s trends include layers and layers of stacked bracelets: models are walking the runway with armfuls of bangles. If you want to emulate this look, add your own personal equestrian touch with our horseshoe bangle bracelet, the Oliver Brown Leather Bracelet, or the custom horse or barn bangle. We absolutely can not talk about great gold horse bracelets without mentioning this spectacular 14K gold panorama horse bracelet. Talk about a show stopping piece of fine horse jewelry! The bracelet has five individually sculpted segments, each featuring scenes of horses in the wild. You won’t believe the detail – and when you put this bracelet on you’ll be amazed by the substantial feel. This is an extremely elegant bracelet, yet eminently wearable. 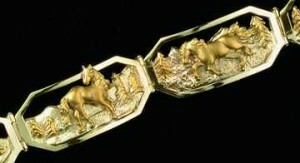 It’s the type of gold horse bracelet that will have a place of honor in any horse jewelry collection. 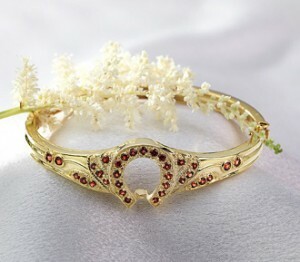 We also love this 14K gold and garnet horseshoe bangle. Cast from an original Victorian mold, this bangle can be made with a number of precious stones. Garnets are great with the vibrant red color: the perfect stone for someone who’s passionate about live, love and horses. The charm bracelet trend continues to be strong this fall. Pandora’s popularity remains: check out our collection of Equestrian themed Pandora style bead charms if you’re working on a bracelet yourself! There are many different charms, including horseshoe charms, hay bale charms, and gold horsehead charms. We love the gold horse jump bead charm’s detail and style. Please, can you tell me the designer & maker of this bracelet? I have one that was my mother’s & would really like to know more about it.